and ran steamboats on the surrounding rivers of the San Francisco Bay. The California Transportation Company eventually merged with the Sacramento Navigation Company and the Fay Transportation Company and became the River Lines Company in 1930. The California Transportation Company operated steamers: PRIDE OF THE RIVER, ONWARD, CONSTANCE, AURORA, SONOMA, RELIEF, IPELTON, SANTA MONICA, ALVIA, ONISBO and the ECLIPSE; barges: ORIENT, CENTENNIAL, STOCKTON, MANILLA, BESSIE, MINNIE, ANNA, YUKON, and the dredge RYDE. Wharfs: Brannon, Grand Island, Isleton, Martinez, Rio Vista, and Walnut Grove, along with Walkers Terminous and Duttons landings. 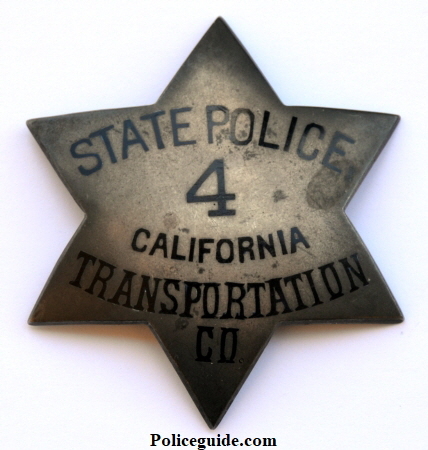 Sterling silver State Police #4 California Transportation Co. badge worn by policemen who protected life and property on the steamships the company operated. 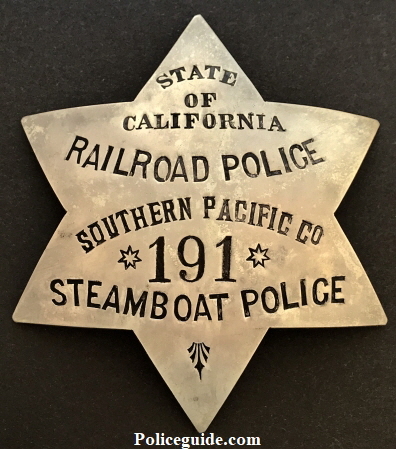 Railroad and Steamboat Police 662 California Southern Pacific Co. Made by Irvine & Jachens 1027 Market St.
S.F. Sterling and dated 12-30-19. 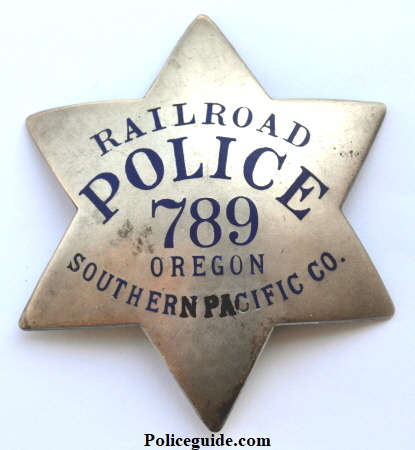 Railroad Police 789 Oregon Southern Pacific Co. Made by Irvine & Jachens 1027 Market St.
S.F. Sterling and dated 8-14-20. 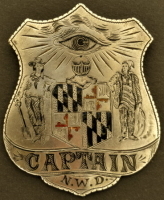 N.W.P. 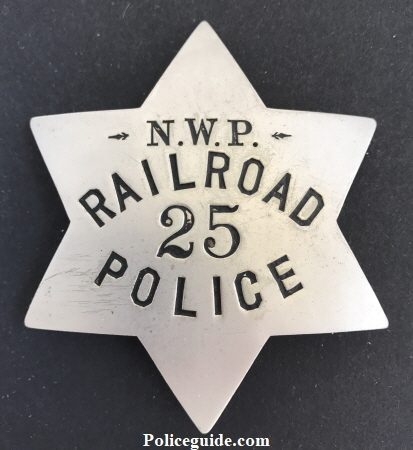 Railroad Police 25 Police. 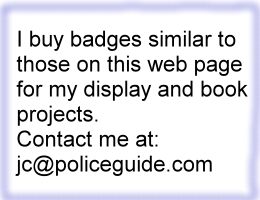 Made by Irvine & Jachens 1027 Market. St. S.F. Made by L.A. Rubber Stamp Co. Los Angeles CAL. 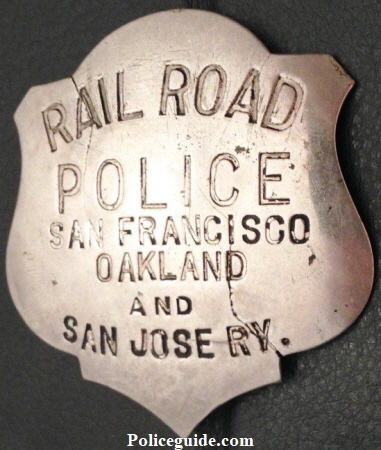 Key System - incorporated 1902 as San Francisco Oakland & San Jose Railway, opened 1903, merged with San Francisco & Bay Counties Railway in 1908 forming San Francisco Oakland & San Jose Consolidated Railway. 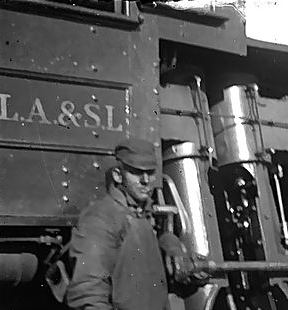 In 1912, San Francisco Oakland & San Jose Consolidated Railway was merged with the Oakland Traction Co.,forming San Francisco-Oakland Terminal Railways. 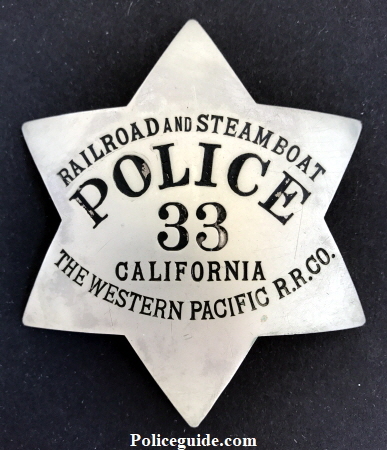 Railroad and Steamboat Police 33 California The Western Pacific R.R. Co. Made by Irvine & Jachens 1068 Mission St. S.F. 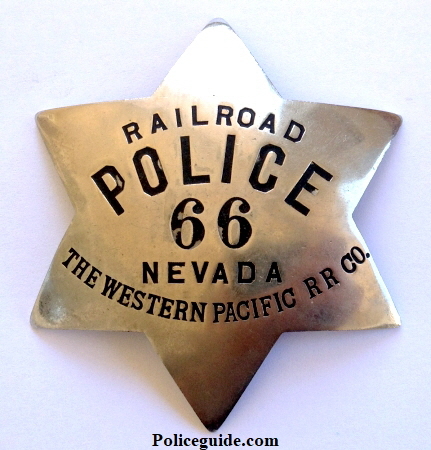 Railroad Police 66 Nevada The Western Pacific R.R. Co. Made by Irvine & Jachens 1068 Mission St. S.F. 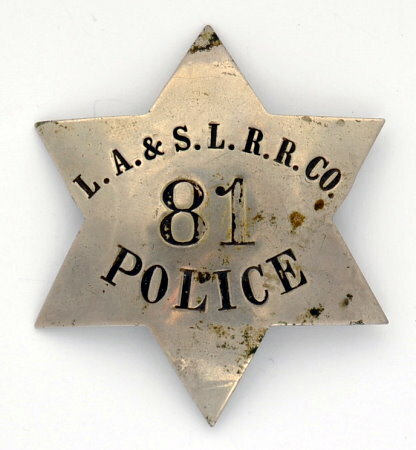 Los Angeles & Salt Lake Rail Road Co. #81 Police badge. 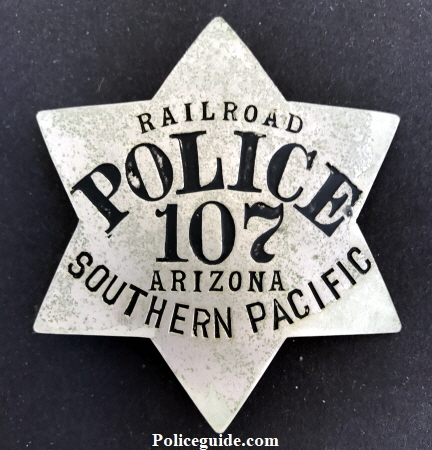 1st issue State of California Railroad Police Southern Pacific Co. Steamboat Police 191. San Francisco Oakland and San Jose Ry. 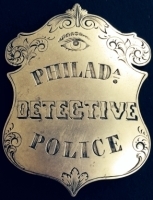 shield, made by Moise-Klinkner Co. 417 Market St. S.F. 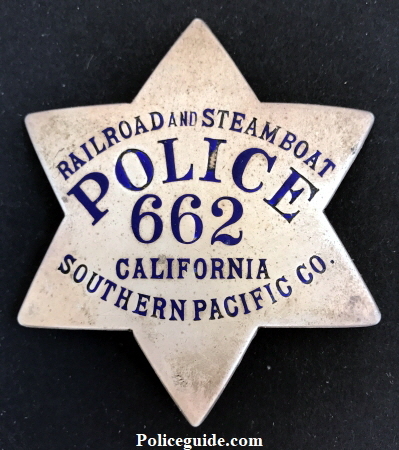 State of California Railroad Police S. F. O. & S.J. Ry. No. 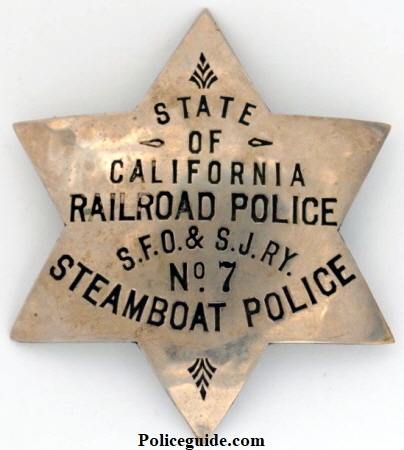 7 Steamboat Police.